1911 2d Deep Dull Green & Red, SG 290, M13(1). A very fine mounted mint corner block of four, three stamps unmounted. 1910 7d Grey-Black, SG 249. A very fine used cds block of sixteen with Guernsey cds. 1911 1½d Dull Purple & Green, SG 288, Spec M10 (5). A superb mint top left-hand CORNER BLOCK OF FOUR, three unmounted mint. 1911 ½d Bright Green (Fine Impression), SG 271, Spec M3 (6). Very fine used. 1902 1/- Dull Green & Bright Carmine, Spec M45 (2). Unmounted mint. 1912 1/- Green & Carmine, SG 314, Spec M47 (5). A very fine unmounted mint lower right-hand corner example showing 1912 DATE CUTS. 1912 9d Slate Purple & Cobalt Blue, SG 308, Spec M41 (4). Superb unmounted mint. 1906 3d Purple on Lemon, SG 234, Spec M20 (5). 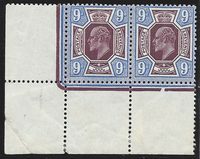 A very fine mounted mint left-hand marginal BLOCK OF FOUR, two unmounted. 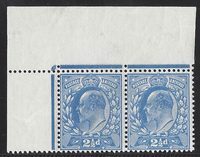 1911 Harrison 2½d Bright Blue, SG 276, Spec M17(2), Perf 14. A very fine mounted mint top left-hand corner pair. 1904 BOARD OF EDUCATION 1d SCARLET, SG 084, tied to OHMS "Board of Education, WHITEHALL." 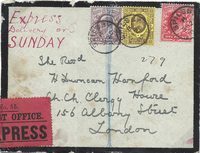 printed envelope to Shrewsbury by a Hereford duplex. 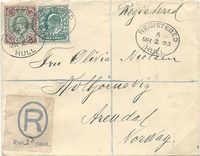 1902 DE LA RUE ½d to 1/-, SG 215-257. Set of 15, lightly mounted mint. 1911 5d Dull Reddish Purple and Bright Blue, SG 293, Spec M30(2). A very fine, lightly mounted mint lower left-hand CORNER BLOCK OF FOUR from the upper pane - three stamps Unmounted. 1911 9d Deep Reddish Purple and Deep Bright Blue, SG 306A, Spec M41(2). A very fine mounted mint lower left-hand CORNER PAIR. 1913 9d DEEP PLUM & BLUE, SG 307a, Spec M41(5). Very Fine Unmounted Mint. 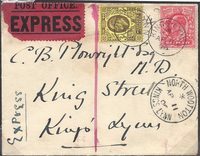 1913 DICKINSON 6d DULL REDDISH PURPLE, SG 301, M34(2). A superb unmounted mint right-hand marginal example. 1913 1/- Green & Scarlet, SG 313wi, WATERMARK INVERTED, Spec M47b. Unmounted mint. 1902 1/- Dull Green & Bright Carmine, SG 257, M45(2). Superb, lightly mounted mint. 1911 ½d Dull Green, SG 270A. CROSS ATTACHED PAIR. Lightly mounted mint horizontal pair. 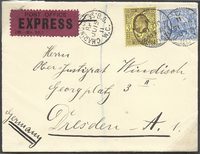 1909 4d Pale Orange, SG 240, M25 (2). A superb unmounted mint top left-hand CORNER BLOCK OF FOUR. 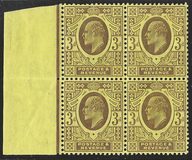 1902 ½d Yellowish Green, SG 218A. CROSS ATTACHED PAIR. A Superb Unmounted Mint Vertical Pair. 1911 6d Royal Purple, SG 295, M33(1). Superb Unmounted Mint. 1911 4d Deep Bright Orange, SG 278, Spec M26(2). Very fine unmounted mint.